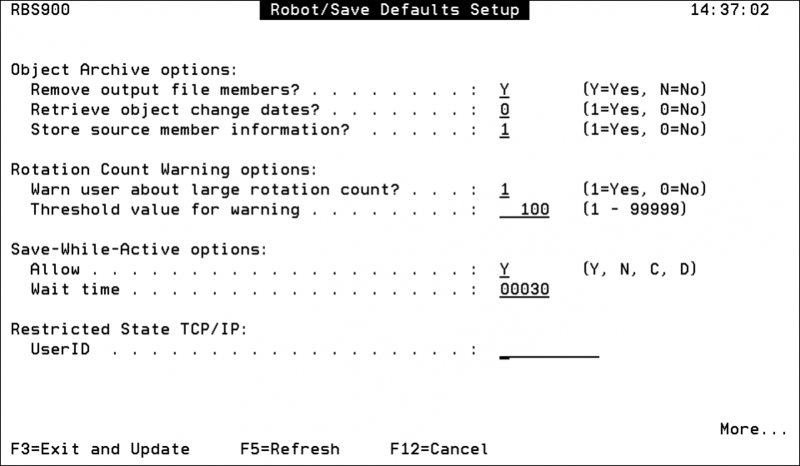 With the proper setup in Robot SAVE, you can run restricted state TCP/IP via the RBSRSURDY command. This allows the systems that are Data Center Participants (DCPs) to share tape volume information, with each other and with the Data Center Management System (DCMS), while in restricted state. You must complete the setup in the section below, and all of the following conditions must be met, in order for restricted state TCP/IP to become active for tape volume file sharing during restricted state. The systems that will run restricted state TCP/IP cannot be standalone systems or a DCMS; they must be DCPs. The participating DCPs and the DCMS must be set up in Robot NETWORK with valid IP addresses. The DCMS cannot be in restricted state while the DCPs are in restricted state, because the DCMS cannot share data while it’s in restricted state. The steps in the following section will help you ready your systems for restricted state TCP/IP. Setting up your system to run in restricted state TCP/IP is a three-step process: specifying the user ID for the restricted state TCP/IP, setting QRETSVRSEC to a specific value, and adding server authorization for the DCMS. All three of these steps must be completed on each of the DCPs that you want to share tape volume information during restricted state. After you have all the DCPs set up, you can go to the last section below, which is on testing the validity of your setup. The user profile you set for restricted state TCP/IP must be the same one that’s running the RBSRSURDY command. Note: The backup will still run if the two profiles don’t match, but restricted state TCP/IP will not be initiated. We recommend that you use the same user profile in this procedure on all of the DCPs that will be sharing information while in restricted state. Do not leave the UserID field blank on RBS900 as that will prevent restricted state TCP/IP from being initiated. Note: The backup will still run if the UserID field is left blank, but restricted state TCP/IP will not be initiated. Enter a user profile in the UserID field under Restricted State TCP/IP (you will have to page down several times to get to the correct panel). Press F3 to save your changes. Before creating the server authorization entry in the next section (Step 3), all systems that are sharing information in the data center (all the DCPs) must be set to retain the server security data. Note: You must make this change on all the DCPs even if you’re on a non-secured system and aren’t using server authorization entries. Enter option 2 and press Enter. Enter 1 and press Enter to retain the server security data. A server authorization entry is required for the user profile that you set up for restricted state TCP/IP in Step 1 above. rs_user is the user profile set for restricted state TCP/IP (the user profile you entered in the UserID field on the RBS900 panel). If a QDDMSERVER entry already exists, skip this step. user_pwd is the password for the rs_user. Note: The SERVER parameter, QDDMSERVER, must be upper case. After you’ve finished setting up your system to run restricted state TCP/IP, you should test your setup. Note: You must run this test from the system console. When you run this command, it checks to see if all of the criteria for running in restricted state TCP/IP have been met and reports any problems in the job log. It also creates temporary DDM files mapped to the DCMS to confirm that the setup was done correctly.